Buoyed by their enthusiasm, I sometimes paddle with friends Jeanne and Glenn. Last fall Glenn asked if I would help him make a Greenland style paddle as a Christmas gift for Jeanne. This long, tapered design has been in use for hundreds if not thousands of years and offers an alternative to modern high-angle paddles in space-age materials. I said yes. 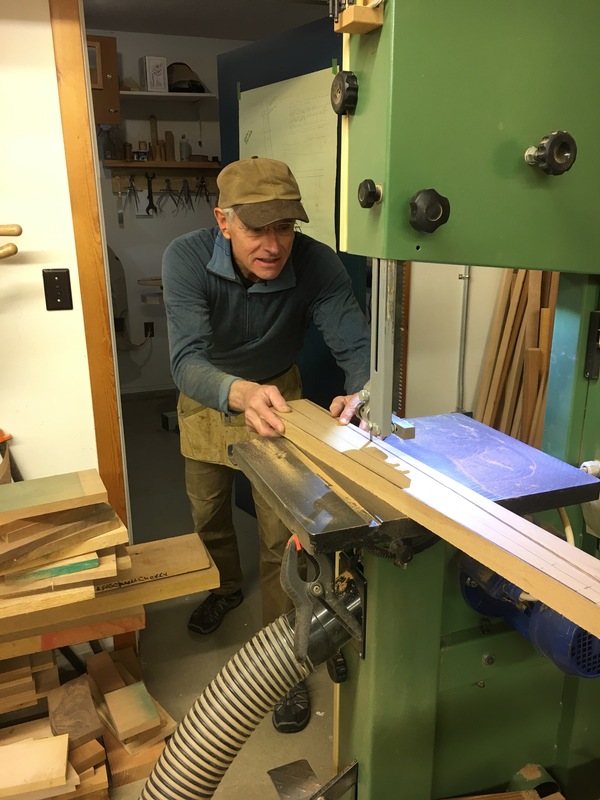 At a local lumberyard that has access to unusual timbers Glenn found a flawless piece of western red cedar. The grain was vertically aligned permitting us to create a reasonably stiff paddle with the least amount of weight. Once we settled on the proper length for the paddle, I jointed and planed the plank to make it straight. We then explored our way to a pleasing taper from the tip of the blade to the handle area. I roughed out the shape on my band saw. 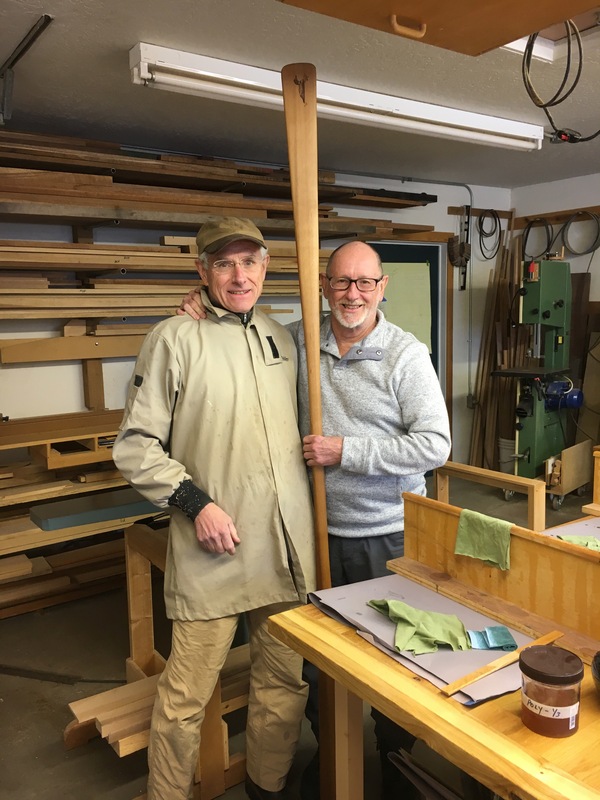 Knowing we had options, I suggested to Glenn he would most enjoy the process of making this paddle if he refined its shape with hand tools rather than power tools. As I demonstrated the effectiveness of my smallest Krenov-style plane and a small brass spokeshave he was convinced. Over the next three weeks we met as often as possible to work on the paddle. When our work periods included the lunch hour, Glenn kindly brought fried chicken and wrapped sandwiches. Day after day Glenn removed material, looking for a pleasing shape and a proper feel in the hand. Gradually the paddle gained symmetry and the lines began to flow. 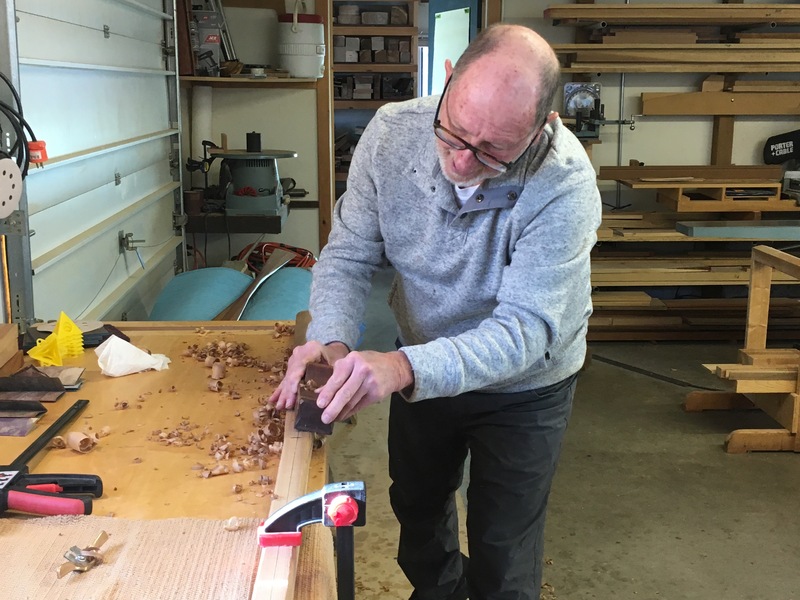 Eventually we unified all the small facets from the tools’ passage over the wood by hand sanding through a series of abrasives until the paddle was extremely smooth. We also wet the wood with water to raise the grain, and when it was dry, sanded off the fuzz. We rubbed in some tung oil to reveal the wood’s final color and offer modest protection from the water. But Glenn was not finished. In his mind’s eye he saw a loon and Jeanne’s initials on one of the blades. I encouraged him to draw out what he wanted to see on a piece of scrap paper, then on the wood itself. Meanwhile, I unpacked my wood burning stylus and turned on the pyrograph. 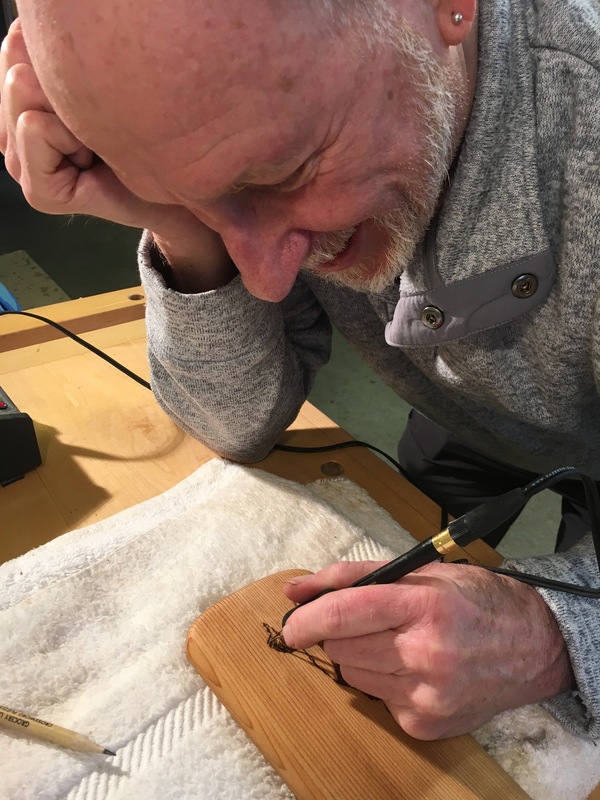 After a little practice Glenn mastered the pace of stroking the pen over the surface of the wood while allowing it to recover its heat between strokes. He created a small, beautiful loon and wove the initials into a subtle water pattern beneath the bird. In the end we held the paddle upright and rested the wood on the top of my toes while my wife took a photo of the proud craftsmen.